Kanatadika from ancient times was an area where its inhabitants were engaged in the manufacture of all kinds pottery . This also reveals the name “Kanatadika”(the land of potters), which is the name of the entire coastal area and Keramidogournes a section of the small Livari, from where they extracted the soil rich in clay, forming large-sized basins (gournes ) that have remained till today. The area until the 1970s had pottery workshops. Today, apart from the name and the toponym, there is nothing else that reminds the previous occupation of the inhabitants. Since our establishment to this day we have noticed that when we were working on the estate, pieces of clay objects were coming out on the surface. So we began to learn the history of the area and it was the beginning for the revival of this art in our estate. With great respect, we approached the last potters who worked at Kanatadika and started looking for items related to pottery. 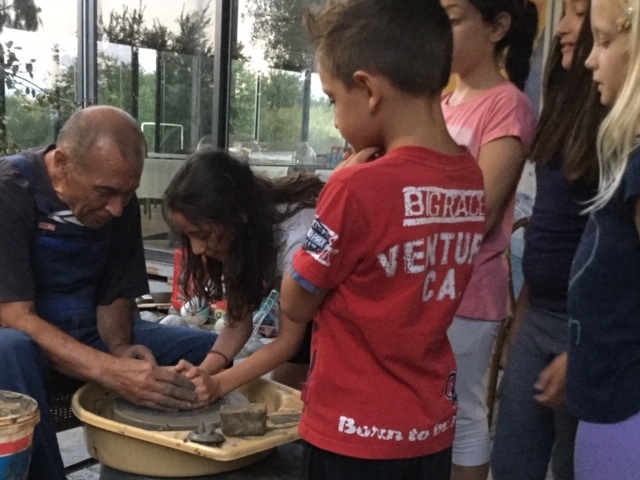 We met Mr. Giannis Stagidis, a potter using clay as our ancient ancestors lovingly, for the construction of objects of use. His collaboration with academics and researchers made him a specialist in the manufacture of ovens for bakery of clay objects. Such an oven, which our ancestors have been using since the 5th century BC, we also built in Aenaon Thus in Aenaon we decided to create a contact point with pottery, with the representation of a workshop where people of all ages can see, and participate in the construction of clay objects, starting from the production of clay.